Mayor Robert Garcia speaks at the unveiling of the city's 2019 budget at Rancho Los Alamitos on Tuesday, July 31, 2018. Courtesy photo. The city on Tuesday released a 2019 balanced budget proposal that boosts funding for public safety, infrastructure and fighting homelessness, but tough choices remain in the face of rising pension costs and slow revenue growth. City officials had initially projected a roughly $15 million shortfall for the coming fiscal year, which begins Oct. 1, but were able to fill the gap in part by freezing open positions, raising parking fines by $10 and increasing ambulance fees to match county levels. The city is also considering taxing short-term rentals, like Airbnb. Mayor Robert Garcia said this budget is balanced and “responsible,” while also providing critical investments to fight homelessness, fix more streets and support police and firefighters. “Of my five budgets as mayor, this by far the best one yet,” Garcia said at a press event Tuesday at Rancho Los Alamitos, which saw seismic upgrades this year due to the Measure A sales tax. City Manager Pat West said recent ballot measures have helped Long Beach maintain and in some cases add services. “That is what is keeping Long Beach strong and making Long Beach stronger,” he said. The proposed $499 million general fund—17 percent of the city’s total $3 billion budget—once again received a healthy boost thanks to the Measure A sales tax increase, approved by voters in 2016, officials said. The general fund comes from taxpayer money and pays for services including police, fire, parks and libraries. Officials also praised last month’s passage of Measure M, a charter amendment that allows the city to transfer up to 12 percent of water and gas revenue to the general fund. However, some revenue sources, like the Measure MA tax on cannabis sales, haven’t generated as much money as projected. Officials are hopeful that major construction projects underway will eventually provide a revenue boost, but for now, future projections are shaky. There are many unknowns, including bargaining negotiations with unions whose contracts expire this year and next. City officials are projecting a $9.3 million shortfall for 2020, followed by an $800,000 surplus in 2021. The deficit is largely due to pension obligations, officials said, and the surplus is largely due to debt service that will be paid off in the next few years. 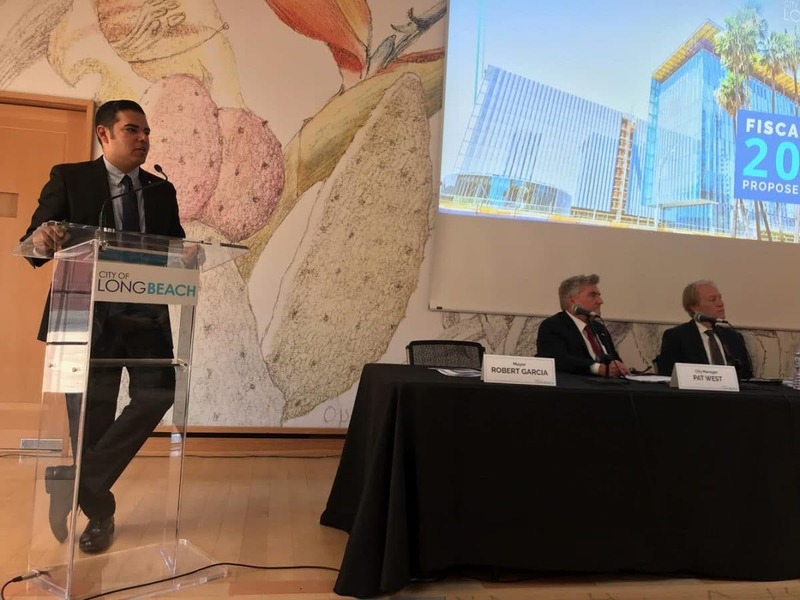 While Long Beach, like many cities, faces challenges with pension obligations, the city is in better shape today because it made significant pension reforms in past years, Garcia said. The city expects costs to peak in about 10 years before they begin to decline. The City Council will discuss the proposal and give final approval in September. The city over the next month will hold a series of budget meetings open to the public. Public Safety: Through Measure A, the city can maintain 108 police officer and firefighter positions that otherwise could be cut. The budget also provides funding for four additional Quality of Life Police Officers, $1.9 million for the Neighborhood Safe Streets Initiative, $3 million for second police and fire academies, $2 million to upgrade the police department’s records system and $600,000 for a safety camera network upgrade. The mayor has recommended restoring Fire Engine 17 in East Long Beach with 12 new firefighters and restoring the police department’s bike patrol by adding a team of six new police officers by asking the City Manager to identify new sources of revenue next year. Garcia would also like to see $250,000 to fully fund the Justice Fund to support immigrants who need legal assistance, and double the budget for Language Access services to $160,000. Homelessness: The city already is investing $14 million on homeless outreach and response. The new budget includes two new firefighters for the Homeless Education And Response Team, a new waste operations supervisor to support encampment clean-ups, and $225,000 in one-time funding for a “proactive homeless initiative.” The city also is receiving $12.3 million in state funding for its homeless initiative and $3.4 million in capital funding for a year-round homeless shelter. Infrastructure: The $120.8 million Capital Improvement Program is investing in areas including public facilities, parks and recreation, beaches and waterways and utilities. The budget allows for $8.3 million for street repairs, alley improvements, and sidewalk improvements and $1.2 million in funding to water city parks, which are facing severe drought conditions. The city is also providing $1 million for a new collection system to remove debris from the Los Angeles River base. Other Highlights: Library hours have been changed so residents will have access to at least one library in the city seven days a week. The budget has also allocated $170,000 for arts programs, including enhancements for Long Beach Museum of Art, Art Counil and MOLAA, and $200,000 to help expunge low-level marijuana convictions. The city described its budgeting philosophy this year as generally conservative, but acknowledged that officials made several assumptions—including factors that are largely out of the city’s control. The economy will remain strong. Roughly one-fifth of the city’s revenue comes from property tax, or an expected $114 million in 2018; sales tax revenue for the city is expected to be almost $63 million this year. Both are vulnerable in a weak economy. No city services are expanded in 2019, beyond what the budget calls for. Costs for the $520 million Civic Center are as expected, and the city can occupy the building by July 2019. Oil prices remain at or above $55 a barrel. The city in 2018 projected the cost per barrel at $45, but oil is currently selling at roughly $70 a barrel.